GameStop Kids aims to "take share away" from other toy stores. Pretty much everyone loves massive gaming retailer GameStop, but if there's one thing missing from the chain's shopping experience, it's that there just aren't enough kids running around. The company aims to fix this problem by opening stores specifically designed for a younger audience. Appropriately named GameStop Kids, the first opens today in Grapevine, Texas, which is also the location of GameStop's headquarters. 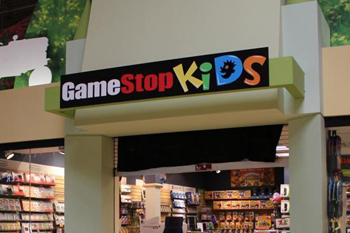 The company plans to have 80 GameStop Kids stores ready to go by November 15. GameStop Kids has been in the works for about seven or eight months, according to CEO Paul Raines, and has been tested in different countries. German GameStops have their own Angry Birds sections, while Australian stores "have a ton of Minecraft product." With GameStop Kids, parents now have a one-stop shopping location for E-rated games, accessories, and gaming-related toys "ranging from a two-foot-tall talking plush Star Wars Chewbacca to a Skylanders backpack." "This is really a way for us to take share away from people who are in the toy business and have an expanded assortment," Raines said. Whether the stores stay open after the holiday season depends on how successful they are this year, but if everything works out this experiment could become another channel of the company. All of the GameStop Kids stores will be in malls that already have "a better-than-average GameStop." When I worked at GameStop, toys were never big sellers, and parents generally didn't care enough about ratings to want an entire store for E-rated games. It's an interesting concept, but I'm not sure if it's going to work as well as GameStop wants it to. Either way, the company still has about 6,700 regular stores worldwide to fall back on.